Given the date, I figured I’d link up to my list of favorite horror films but, lo and behold, it doesn’t appear I ever made one! Anyway, I’ll offer this list. If I did make a favorite horror film list before and just proved how inept I am at finding it, consider this the 2014 edition of E.R. Torre’s Favorite Horror films. Nosferatu (1922) The very first version of Bram Stoker’s famous novel Dracula is, in my opinion, the best. While Bela Lugosi made a great Dracula, Max Schreck’s Count Orlok is positively chilling. This is a great, timeless film, made all the more incredible because film itself was in its infancy during this time. The film was recently restored and released on BluRay. Very much worth checking out if you haven’t yet! Duel (1971)/Jaws (1975). Yes, a bit of a cheat here, including two films at once, but I’ve always felt these two films were part of a single whole. Both were, of course, directed by Steven Spielberg and the first put him on the map while the second made him a superstar. Both films are also, in my opinion, thematically similar as they follow a “common” man’s attempt to destroy a murderous, seemingly unstoppable monster. …while Jaws featured a giant man-eating shark. Assault on Precinct 13 (1976) Perhaps my all time favorite “siege” film. Director John Carpenter, just before hitting it big with Halloween, delivers a tense, unflinching suspense film that does not let up. A group of prisoners are held overnight in a Police Precinct that’s about to be shut down. A skeleton staff watches over them, unaware that the shadowy, deadly gangs of L.A. have united and are intent on terrorizing the city. Their first target? Take a wild guess. The Warriors (1979) Director Walter Hill delivered a terrific, suspenseful reverse siege film with The Warriors. In this case, we have a gang that’s deep in “enemy” territory trying to make their way home while every other gang out there wants them dead. The climax of this film -and the villains taunts- are the stuff of legend. Unfortunately, Mr. Hill returned to the film a few years ago and made a bunch of changes, delivering his “Director’s Cut” of The Warriors. This version is the only one available on video nowadays and…well…it’s not as good as the theatrical version. Perhaps one day we’ll get it back. The Shining (1980) When I first saw this movie in theaters back when it was released, I didn’t find it scary at all. At the time I was just starting to recognize certain names in the industry, and director Stanley Kubrick was, to me, an unknown. Shortly afterwards I discovered -and grew to absolutely love– his movies. The Shining, however, remained a curiosity. Perhaps, I figured, Mr. Kubrick simply misfired. Then, over the years, I would catch bits and pieces of the movie on TV and I’ll be damned if the film’s eerie horror didn’t gradually work its way into my blood. While The Shining may not be one of those films that grabs you by the throat on its first viewing, its one of those horror films that festers and grows. A terrific piece of moody horror. Dawn of the Dead (1978) George Romero shocked the world with the low budget 1968 Night of the Living Dead but, to me, his follow up truly took the Zombie genre into legendary realms. A movie that is alternately horrifying, gory, dramatic, and…humorous? !… Dawn of the Dead has it all. A movie whose influence is still being felt today…I’m looking at you Walking Dead. There are those who think Terminator 2 is the better Terminator film. I disagree. The original, though made on a far lower budget, is to me far more relentless. As for Aliens, Mr. Cameron another great (and scary) roller coaster ride! The Horror Movie Music Quiz! I managed to get 10 of 13 (making me just slightly above the average of 9 out of 13). I probably would have done worse but the Wheel of Fortune way they make you fill in the movie’s title allowed me to figure out at least two soundtracks though I had no idea where the music was from (one movie’s name is very long while the other has an apostrophe, which helped to figure out at least one of the letters!). So much so that I suddenly had four novels in the works simultaneously, three of which were new and one of which I wanted to finally get “done”. As of last Friday, October 24, I finished the first draft of that later novel, a story that is effectively the conclusion/postscript to the whole Corrosive Knights saga. I had a “rough draft” of this story done years beforehand in the form of a graphic novel/comic book but felt since the other Corrosive Knights stories were presented as novels, I might as well make this story a novel as well. Earlier this year I began converting the graphic novel into an actual novel. So last Friday I finally got the first draft of this novel done. It’s a little on the skinny size, clocking in at a mere 50 pages, single spaced (in comparison, my other Corrosive Knights novels run about 170-200 pages). This is obviously a bare bones work at this moment and there’s much more work to be done with it. I suspect when I’m properly done with the novel, it will be closer in size to the other Corrosive Knights novels. The big question, therefore, is: When will this novel be ready and released? That question is a tricky one to answer. Now that I have this first draft done, I intend to put it on the back burner and work on it with whatever spare time I have while focusing more exclusively on Corrosive Knights books #6 and 7 and my standalone novel expanding on a short story in my Shadows at Dawn book. The fact is that this “final” Corrosive Knights story is just that and I want to have it completed but I don’t feel it appropriate to release it until the other Corrosive Knights stories are out. While tempted to pat myself on the back because of my ability to get something done and save its release for another day, I’m certainly not the first author to do something like that. During the London bombings of World War II, mystery author Agatha Christie wrote Curtain, the final Hercule Poirot novel, because she feared she -and England!- might not survive this war and she wanted to have a final story for her beloved sleuth. The war ended and Ms. Christie kept that novel in a safe until the 1970’s, when she was very old and knew she would be unable to write any other books. It was then that Curtain was released. …I just knew it wouldn’t be long before we’d have a long line of people ready, willing, and able to parody it. Given how weird those commercials were, I couldn’t wait. …a couple of interesting Halloween themed lists. The gifs are good. My favorite is probably the very last one, regarding Friday The 13th Part 3, which was filmed for 3D but which some of those 3D effects didn’t look quite as scary when put into regular old 2D. #3, found on the first page of this link, is particularly gruesome as it details (and in one case shows!) a person who “survived” a scalping. I’m tempted to include the photograph of the scalping survivor below, but it truly is quite revolting. Besides, if you really want to see it, you can do so by clicking the link above. Don’t say I didn’t warn you, as this stuff is not for the faint of heart! I first heard about Cold In July when it was making the film festival circuit earlier in the year. People said very good things about it and, given that it was based on a story by Joe R. Lansdale (Bubba Ho-Tep), I was intrigued. The film was barely released to theaters but when it arrived on the home video market (without too much fanfare, sadly), I needed to see it. Yesterday I finally had the chance to do so. What I saw was a film that started somewhat slowly, taking its time to build the central character and going in a certain direction only to make several interesting twists and turns before, unfortunately, ending on a rather bland note. The plot of the film, at least as much as I’m willing to reveal without getting into spoilers, starts with Richard Dane (Michael C. Hall) awoken by his wife late at night. His wife heard something and, sure enough, it is apparent someone has broken into the house. Richard goes to his closet and gets his handgun, then makes his way to the living room. There, the very nervous homeowner confronts the robber and, without meaning to, kills him with a single shot. Afterwards, the police arrive and go through the procedure of writing their reports. They assure Richard that what he did was self-defense and there won’t be any problems afterwards. Only things aren’t always what they seem and the story goes through several clever twists and turns. To me, this was where the movie really started to soar. Despite the obvious low budget and the filmmakers attempts at emulating early John Carpenter films, I was fascinated by the developments and, in particular, the scene stealing turn by Don Johnson. His P.I. Jim Bob was easily the highlight of the second part of the film. Unfortunately, and as I stated before, this intriguing film builds up to a climax that is neither terribly suspenseful or original. Rather than leave me breathless and amazed, I was left thinking I’d seen this type of climax many times before…and better done (think Rolling Thunder). Assuming the movie was true to Mr. Lansdale’s story, one gets the feeling that he came up with a lot of clever concepts but didn’t have a terribly original or clever way to wrap it up so he went for something tried and true. And, unfortunately, not terribly great. In the end, I can only offer a mild endorsement for Cold In July. For most of its runtime this film is clever, original, humorous, and surprising but unfortunately gives you a very unsurprising ending. So last week I was summoned to Jury Duty and found myself in a rather small Jury Duty pool, certainly smaller than the previous crowd I was involved in several years before. As the morning unfolded, I was surprised by how many times and in how many ways the people operating this offered apologies for our being there. It began with their public service video that described the Jury Duty experience and what you could expect. It noted attending this was a small sacrifice to make for this great country. Yet, again and again, the message of pride was prefaced and/or followed up with profuse apologies for the disruption to our lives. After the video was over, a lady appeared at the front and center of the room and essentially went over much of the same, including, yet again, offering profuse apologies for this disruption to our lives. When she was close to being done the first two waves of potential jurors were called in and, once they were accounted for and gone, the movie The Blind Side began on the various monitors and the remaining pool of potential jurors, including me, sat back and waited to see when/if we were called. In my case, the call came close to 11 A.M. At that point, I kinda knew it was coming. As I said, the jury pool this time around wasn’t all that large and, after four or so groups were called in and given the small amount of potential jurors left over, I figured my odds of getting selected were high. I was right. Thirty five of us were lined up and assigned numbers (I was 26) and taken downstairs and to the opposite end of a corridor from the trial room itself. We waited around for nearly an hour before being let in and introduced to the councils and judge. Then, it was off to lunch with the admonition to be back in that opposite end corridor by 12:45. We were all back by then, but wound up waiting until nearly 2 P.M. before finally, finally being taken back into the chambers. What followed was the process of council Q & A. It was there that we were given some idea of what this upcoming trail was about. Basically it went something like this: The defendant was a convicted felon allegedly found with bullets in his possession. Not handguns. Not machine guns, not mortars. Not BB guns. The man was accused of being found in possession of bullets, obviously a no-no for a convicted felon. Reading between the lines (and making an assumption on my part), I had the feeling it wasn’t even a terribly large amount of bullets. This assumption, by the way, was based on the questions asked by both Council members. Now, I’m not a gun nut. In fact, I feel there are way too many guns out on the street and, further, that people who quote the 2nd Amendment, including politicians and judges, too often ignore the whole “well regulated militia” statement. Still, based on what little I heard about this case from our questioning, it was just as well I wasn’t selected to the final seven jury pool. I don’t know how I would have reacted as a juror, but in the end it seemed the entire trial was a lot of fuss made for what amounted to a relatively small matter. A matter that perhaps should have been dealt with before the trial itself. By the time I got out, it was a little before 5 P.M. I, along with 34 others, had spent the whole day there, for the most part sitting or standing around and doing not all that much. Seven of these people would now have to return the next day and perhaps the day after that for the trial itself (the judge felt the case might take 2-3 days). Tough going. No wonder there’s so many apologies offered. Shout! 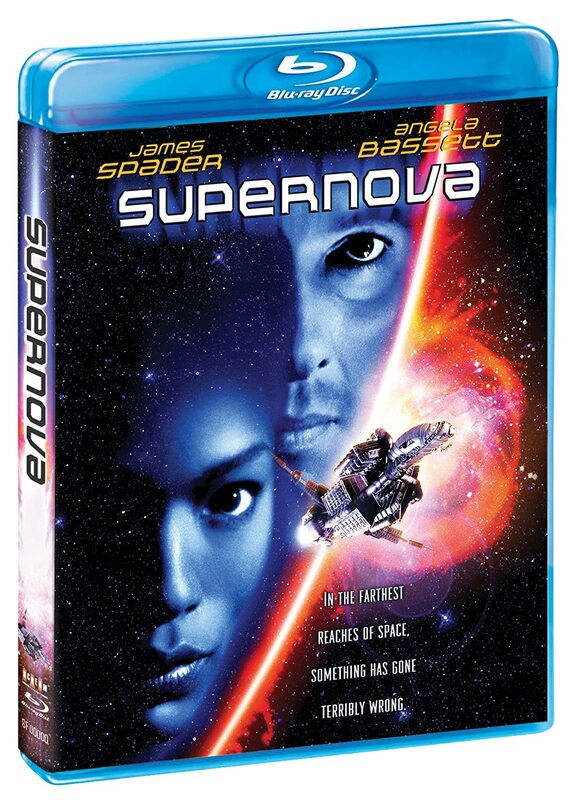 Factory, the company whose focus appears to be in releasing quirky, cult films of yesteryear, will be releasing the 2000 sci-fi horror film Supernova to BluRay in January of 2015 (read about it here). Considering Shout! Factory’s previous releases, I’m expecting some pretty interesting bonus material here…perhaps even the film’s original Walter Hill rough cut. According to the above, Geoffrey Wright was the movie’s original director but dropped out. The legendary Walter Hill then took over and, effectively, “made” the film. However, toward the end, when it was in the process of being edited for release, there were clashes between the director and the studios and Walter Hill abandoned the project. Francis Ford Coppola (yes, Francis Ford Coppola!!!!) then came in and, using the footage available, assembled the theatrical cut which was unceremonially dumped into theaters with the directing credits listed to the pseudonym “Thomas Lee”. You should check out the above link, if only to see some alternate sequences that were presented in the original DVD release of a few years before, including the movie’s original, far darker alternate ending. What makes Supernova even more fascinating to me is that it seemed the general theme and certain elements within are not unlike that of 2012’s controversial Prometheus. In fact, I’d be bold enough to say that Supernova, if not a “first draft” of Prometheus, in some ways had to be an inspiration to that later film. And why not? Director Walter Hill is the producer of all the Alien films, from the classic Alien and Aliens all the way to, yes indeed, Prometheus. Perhaps the inspiration was subconscious. Or perhaps Mr. Hill was still smarting from the failure of Supernova and felt the general story (or rather story theme) deserved a second shot. I don’t know, but I’m damn curious to get my hands on Shout! Factory’s BluRay the day it is available! I’ll be the first to admit there’s something morbidly fascinating about reading lists like this. What is probably the most scary is that for the 19 ladies mentioned, there are very likely hundreds if not thousands more that may well have done far worse in their lifetimes but whom history may well have forgotten or, even more frightening, might still be alive today but have managed to keep from being caught! I saw the very low budget sci-fi/horror film Without Warning one night while it was playing on cable way, waaaay back in the very early 1980’s. Perhaps as early as 1981. I remembered very little about it, but what I did recall stuck with me for decades. To elaborate, my main memories of the film involved the flying “organic” discs that the alien flings at its victims. I remembered finding the whole thing so gory…again, for that particular time. When the movie arrived, I simply had to see it from start to end and see what/why pieces of it had lingered in my mind for so very long. What I found was a decent enough horror film that can rightly be called a precursor to the far better known Predator. Certainly the plots of both films share this much in common: They both feature a mysterious and deadly alien hunter whose prey is homo-sapiens…and who has no trouble killing his prey in gruesome ways. While Predator featured a bigger budget and, while scary, was primarily an action film, Without Warning’s focus is more toward horror. Like Predator, the plot is quite simple: Two young men and two young women (included among them a very, very young David Caruso) head out the “lake” but before reaching it stumble upon some seriously strange locals at a run down gas station (Jack Palance and Martin Landau, both of hamming it up and turning their creepiness factor to “11”). Martin Landau appears dazed, a veteran of the armed forces who may not have a grip on reality. Jack Palance, on the other hand, is razor focused and imposing. When the young ‘uns tell him they’re going to the lake, he warns them to stay away…for, he says there are hunters there. What follows is a pretty decent (if not all that terrifically acted by the newcomers), Lovecraftian story involving the survivors of the trip to the lake and Palance and Landau’s characters as they face off against the alien threat. The film was quite good in the early going, when we see people become victims to the aliens and, eventually, when the main characters gather together in the diner sequence. If you’re a movie buff, you’ll find a couple of fascinating faces in that particular crowd, including the last acting appearance of the very best Mike Hammer there ever was, Ralph Meeker. Shortly after this diner sequence, the film kinda slows down as we follow the young survivors of the lake and, unfortunately, during this period of time both Martin Landau and Jack Palance disappear. But, fret not as they return in time for the climax which…well, is explosive, but all too obviously on a much smaller scale than the film’s makers would want us to believe. Despite its flaws, I enjoyed seeing this for the most part forgotten film. Is it classic cinema? No. Is it unjustly forgotten? Probably not, though seeing all these veteran actors chewing the scenery is fun. As for the gore that stuck with me all these years, I suspect by today’s standards all these scenes could be shown on TV completely uncut. If you’re like me and have any memory at all about Without Warning, its a fun trip into the past. For those who are thrilled with the idea of Jack Palance and Martin Landau facing off in a Lovecraftian horror film, you might want to give it a spin. For everyone else, it might be a pass.